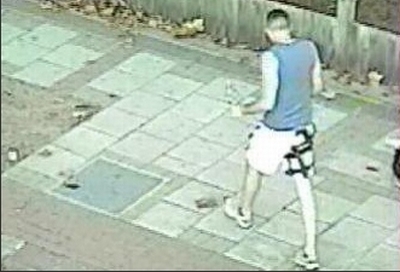 Police have released CCTV footage of two people they'd like to speak to in connection with Stephen Lawrence's memorial plaque being vandalised. On Sunday, shards of glass were reported scattered over the plaque in Eltham, at the spot where the teenager was murdered. The CCTV shows a man in shorts and t-shirt walking alongside a blonde woman pushing a buggy, and is from Saturday evening. This isn't the first time memorials for Stephen Lawrence have been targeted: the plaque has previously had paint and flammable liquid poured on it, and the Stephen Lawrence Centre in Deptford had bricks thrown through windows shortly after it opened.